THE $1 billion Empire Industrial Estate at Yatala is celebrating a milestone following the completion of a major development within the 127ha site. Construction is now complete on a $20 million commercial headquarters, occupied by COPE Sensitive Freight, which is the second building to be completed within the estate and the first of three buildings in stage two. CIP Yatala has secured one of the remaining sites, with developers of the precinct The Stephens Group set to retain the third site. Meanwhile, use of the third stage is under negotiation. Empire Industrial Estate was launched in June 2015 and will ultimately comprise around 250 buildings and provide up to 5000 new jobs. The site, formerly known as Darlington Park International Raceway, builds on a legacy left by patriarch Anthony Stephens who died in 2005. Stephen's sons Tony and Phil have pushed for more than 10 years to transform their father's vision to fill a void in the industrial market and boost the Gold Coast economy. The Stephens Group managing director Tony Stephens says the industrial hub is powering ahead with early works now underway on stage four, which is attracting strong interest from a range of local and national companies looking to establish a base in south east Queensland. "Stage four comprises 32 lots ranging between 2200sqm and 10,000sqm, with 14 lots currently under contract," he says. "The lots are selling for an average price of $300 per square metre and have appealed to both light and heavy industry, including a number of smaller distribution companies, courier companies, and truck operators due to the size of the lots, the strategic position and the competitive pricing. 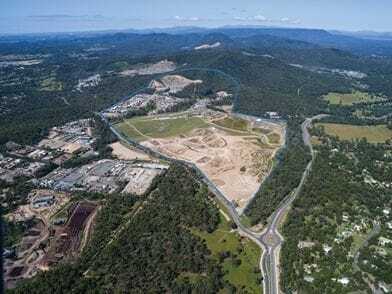 "Earthworks have commenced on-site with the first building in stage four scheduled to come out of the ground in August." When complete the estate will accommodate 550,000sqm of buildings in 10 staged lots. There are currently 113 lots in the 10 stage master plan which will be rolled out over the next 10 years. When fully developed over the next decade, the estate is estimated to inject $1 billion into the Gold Coast economy. "We are committed to creating a state-of-the-art, industrial hub with architecturally designed buildings, a green space conservation corridor and leading edge planning and infrastructure," Stephens says. "Yatala is a thriving growth corridor that will continue to evolve and we are looking forward to the Estate growing with it. "We are off to a solid start, but the dream is to see this estate evolve into an asset that the entire city can be proud of and reap economic benefits from."